This past weekend I was in the basement digging through a box that contained old music cassette tapes (yes I am that old). I was also in the kitchen sorting through the crisper in the refrigerator and found a zucchini that was on the verge of being a good candidate for the compost bin. When I come across older music I usually listen to it to make me feel young again since I’m approaching the ripe old age of 40. How the hell did that happen so fast? When I find older produce in the crisper, that hasn’t gone bad but has slightly shriveled and doesn’t look appealing (sort of like Mick Jagger…sorry Mick), I use it for soup. 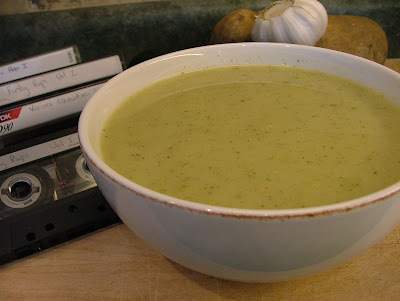 I’ve never made, had or even thought of making a zucchini soup until I saw a recipe in a 2007 Bon Appétit magazine. I was struggling with their suggestion of pairing cilantro, jalapeño peppers and fennel with zucchini and potatoes. I switched things up and simplified the process by pairing the zucchini and potatoes with canned green chilies and garlic. My switch-a-roo worked out fine, for the most part. The only issue was I added red pepper flakes and the spicy heat made my head feel like it was going to blow off my shoulders. I would say the green chilies provide more than enough heat on their own. Despite the overwhelming heat, this zucchini and potato soup impressed me as much as some of the cassette tapes I had found and listened to while preparing it. The standouts were the mixed tapes labeled Peace and Solitude, Funky Raps Volume 1 (yes there is a Funky Raps Volume 2 which is equally as good). There was also the unforgettable….Summer Magic. Just kidding, that tape doesn’t exist in my collection. Although there is still time to create it before my remaining cassette players decide to retire. 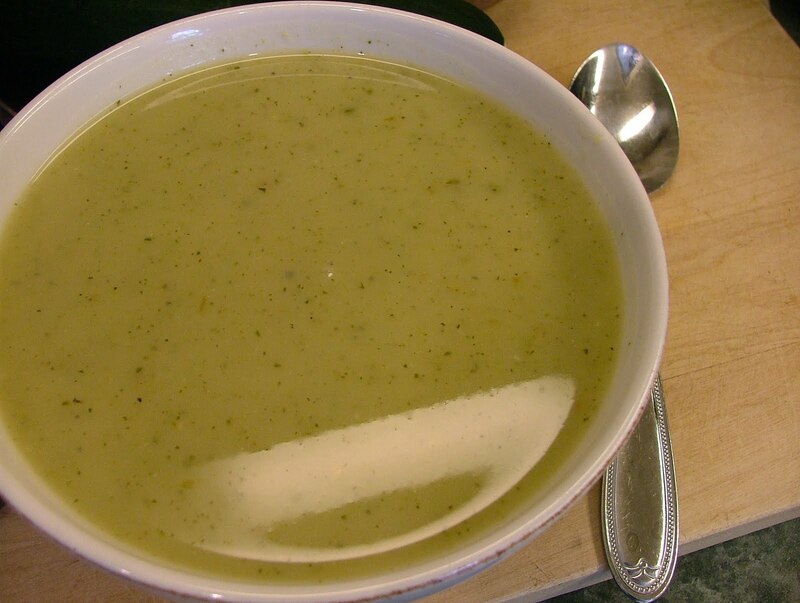 It would go perfectly with this low-fat soup. I’m on it! Hmmm, now what summery songs should I include? Any thoughts? In a large saucepan, melt butter over medium heat. Add chilies, garlic, potatoes and zucchini. Cook and stir for 2 minutes. Add broth and pepper (you can also add a pinch of red pepper flakes at this point if you like your soup extra spicy). Bring to a boil. Reduce heat to low, cover and simmer until vegetables are tender, about 15 minutes. In a blender, puree soup in batches. Return soup to saucepan. Stir in lime juice and season with salt and pepper, if desired. Serve. Tip: You'll typically find the canned green chilies in the grocery aisle that has the tacos and salsa.